JEE Main Exam Pattern 2019: All candidates who wish to pursue their career in the field of engineering or architecture programme, then you need to know the JEE Main Exam Pattern of the exam before applying for the JEE Main 2019 Application Form as it guide you how to attempt the question paper and to score maximum required marks. This exam will be organized by National Testing Agency (NTA) from the next year. NTA has decided to take this exam twice a year so that the best marks from both the exams will be considered for admission to IITs, NITs, CFITs, other government and top private colleges of India. The exam pattern will guide you to know the mode of examination, the difficulty level of question paper, time duration, marking scheme, weightage of each section etc. JEE Main exam will be held in 2 paper i.e. Paper 1 for BTech course and Paper-2 for BArch course. Candidates can choose any one among these 2 papers, as per their choice. They can select either paper-1 or paper-2 or can apply for both papers. Candidates who want to apply for the B.Tech programme can see the below mentioned exam pattern for paper-1. Marking Scheme 4 marks for each correct response. – 1 mark will be deducted for incorrect answer. Zero marks will be allotted for unanswered questions. Aspirants seeking admission into the BArch course can see the below mentioned exam pattern for paper-2. Marking Scheme 4 marks will be allotted for each correct response and -1 mark will be deducted for wrong answer. 2 Drawing questions carry 70 marks for each. JEE Main Paper-1 will be comprised of 3 sections i.e. Physics, Chemistry & Mathematics whereas Paper-2 will contain questions from Mathematics, Drawing & Aptitude Test. Each question will carry equal marks. So it is mandatory to attempt each & every sections of both papers. Check the given below marking scheme table of both papers. After knowing the exam pattern of JEE Main, go through the JEE Main Syllabus prescribed by the NTA and prepare for the exam accordingly. The syllabus of JEE Main will be same as the course of class 11 & 12. JEE Main syllabus will help to get an idea about the topics on which questions are asked. Candidates are advised to know the detailed syllabus of JEE Main and attempt before preparing for the JEE Main 2019 Exam. 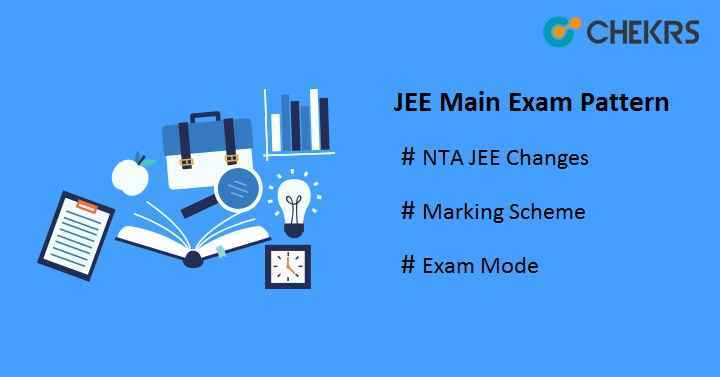 Tags:JEE Main 2019 Exam Pattern, JEE Main Application Form, jee main eligibility criteria, JEE Main syllabus, jeemain.nic.in.